The Ukrainian pioneers left their homeland of Ukraine and their families and their friends, whom many never saw again. They sought a better life and they departed with courage and deep determination to settle in the land of freedom -- the United States of America. People arrived in great numbers and they yearned to worship in their own language and their own Rite – the Byzantine Rite. They petitioned for clergy who could serve them. The people who arrived first settled on the West Side of Elmira Heights. In 1895 they built a small wooden church on the comer of West 14th Street and Parkwood Avenue for the sum of $1,200. They dedicated and placed this church under the protection of St. Nicholas the Wonderworker as a Parish under the Ukrainian Catholic Church of the Byzantine Rite, as we know it today. In the beginning our parish was a mission parish. Rev. John Kontankevich was the first priest to serve our parish. Father had to travel from Shamokin, Pennsylvania. There were also many other priests who travelled to Elmira Heights to serve our parish. In 1907 two lots were purchased on the corner of Horseheads Blvd. and East 11th Street and in 1908, three acres were purchased in the town of Horseheads for the purpose of a Cemetery. year to accomplish. Meanwhile the cellar in the new location was being dug by hand. During the year long relocation effort of the church building, work would cease on Sunday and the Divine Liturgy would be celebrated in the church building as it slowly made its move from West 14th Street to Horseheads Blvd. and East 11th Street. As the parish began to prosper, the first resident pastor was assigned, Rev. Wolodymyr Stech, in 1913. In 1936 the church purchased two new lots. In 1942 and 1943, the church purchased more lots on a wooded, swampy bed which was converted into what is now "St. Nicholas Ukrainian Park" – the Church Picnic Grounds. After World War II, the church encouraged the Veterans of War to organize into what is known today as the Feshoh-Macekur Catholic War Veterans Post 1178. In 1946 the church acquired the Ukrainian Hall on Lackawanna Avenue in the city of Elmira which was renovated. Zebavas (dances) were held here mo nthly. Verchovyna (Ukrainian dance group practiced here) and religious classes were held here for the children living in Elmira. The end of World War II brought a flood of Ukrainian Refugees fleeing from the Communist occupation of Ukraine. About forty refugee families settled in Elmira and the Church aided them in obtaining work, homes and legal advice. The Ukrainian Hall on Lackawanna Avenue would be sold many years later. On June 8, 1950, Paul Harchison, from our parish, was ordained to the Holy Priesthood by His Excellency Bishop Constantine in the Cathedral of the Immaculate Conception in Philadelphia. 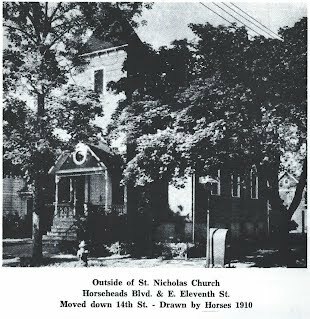 In 1951 the church purchased a 14 lot plot which is today the site of St. Nicholas Church. August 31, 1958 the blessing and dedication of the new church and annex took place, although the Church interior was not yet completed. The Solemn Blessing of the iconostas took place on October 9, 1960. The new Rectory was completed adjacent to the church in 1963. On May 5, 1968, the parish celebrated the liquidation of the church debt and the mortgage was burned in celebration. In 1974 St. Nicholas Church strongly urged that land across the street form the church be turned into a park and be named Shevchenko Park to honor the great Ukrainian poet Taras Shevchenko. On August 31, 1981, ceremonies were held to dedicate and bless the monument in honor of Taras Shevchenko which stands at the entrance of the park named in his honor and faces St. Nicholas Church. Over 1,500 people attended the dedication ceremony which was taped by Radio Free Europe and broadcast to Ukraine on a later date. St. Nicholas is the Mother Church for those faithful of the Eastern Rite both Catholic and Orthodox in the Southern Tier of New York and the Northern Tier of Pennsy1vania. Among the Churches which were established from St. Nicholas are: Ascension of our Lord Ukrainian Catholic Church, Sayre, PA; Christ The King Ukrainian Catholic Church, Bath, New York (now closed); Holy Trinity Russian Orthodox Church, Elmira Heights, NY and St. Mary’s Carpatho-Russian Orthodox Church, Corning, NY. The largest activity within our parish is the weekly Pyrohy Sale. On February 24, 1956, the "Pyrohy Ladies" made their first sale and made a net profit of $22.62. The Pyrohy Project was mostly responsible for the liquidation of the church debt in 1968 as well as continuing to be a major source of income for St. Nicholas Church today. The parish of St. Nicholas is indeed grateful and proud of these good parishioners - `for sacrificing their time and effort week after week to make pyrohy all for the love of their church! In 2012, St. Nicholas had the privilege of hosting its 65th annual Festival, an event acknowledged by the local government as being the oldest in the area. As our Church population has been steadily decreasing, it has become a real challenge to recruit the many workers that are needed to hold a successful Festival. Other fund-raising options which do not require a huge number of workers are being considered and tested currently. Only time will tell if a Festival is possible in the future. Let us not forget the dreams and hardships of the pioneers. Let us pause and pay tribute to all the departed members of our parish, let us thank God for all the blessings He has bestowed upon us and let us pray that we may find strength and wisdom to continue the work that lies ahead.